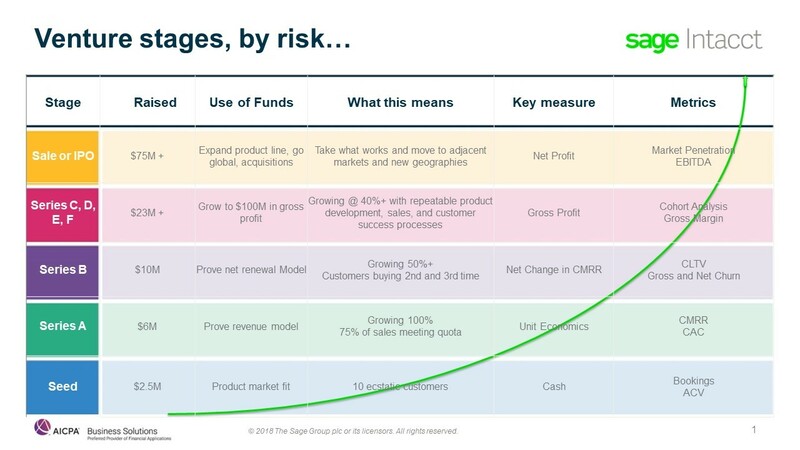 In this post, we’re going to share some powerful insights into the SaaS metrics investors want to see from SaaS start-ups depending on their stage. 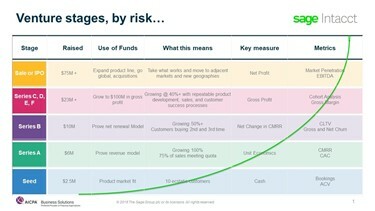 These recommendations are shared by fellow SaaS finance leaders and their investors, who participated in several conversations at the inaugural Modern SaaS Finance Summit during SaaStr in February 2019. We’ve created this simple guide for finance leaders by introducing the key objective with each stage of the company, what it means, how to measure it, how the finance team plays a role, and the processes that must be built to make this objective successful. Our former board member, Jeff Epstein, operating partner at Bessemer Venture Partners, discussed the use of funds and key measures you need to focus on to get to the next stage. Similarly, several finance leaders who have successfully guided their companies through growth, discussed how they scaled the people, process, and technology, including using Sage Intacct, to prepare for each stage on the journey to $100 million and beyond. We will be having another Modern SaaS Finance Summit in NYC on May 16 and encourage you to join us to learn how you can apply these principles to your SaaS start-up. MORE FROM Sage Intacct, Inc.